I believe I have posted about these previously. Honestly though, I just want to drive home the point that it is so easy to get creative with breakfast. We get so tied down to processed “crap” for breakfast on our busy work mornings that we forget about the other options. Sure, you can make this healthier and all…but the point still stands. Simple, homemade, and warm in the morning is good for the breakfast soul. Spray muffin tin with baking spray. I used a jumbo muffin tin. Put one biscuit in each muffin hole. Next, cook bacon to desired doneness. I preferred crispy since it was going to be mixed with the eggs. It would hold it’s own better in the mix. 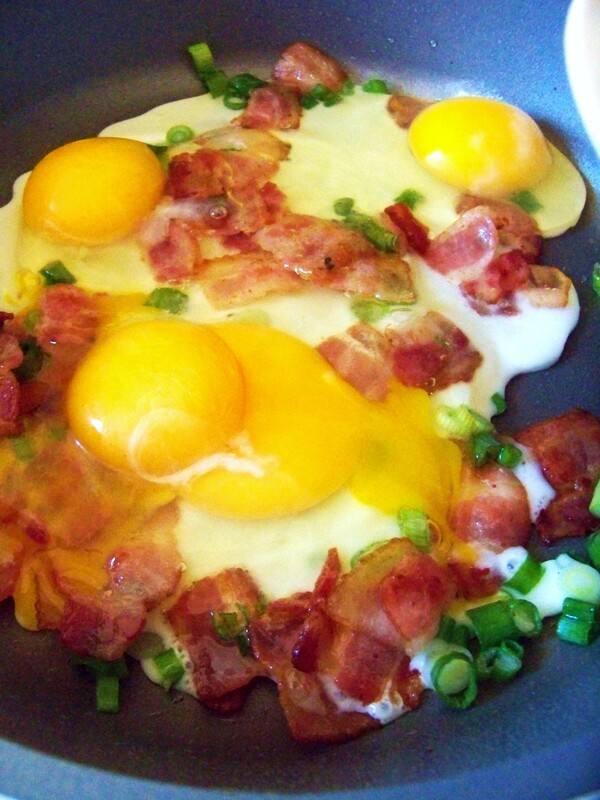 Add the eggs, onions, salt and pepper to the skillet with the bacon and cook until the eggs are soft set (just before the doneness of how you would serve them). Stir in cheese, and spoon the mixture evenly amongst each biscuit. Bake for 20 to 25 minutes at 350 degrees. You are looking for the biscuit to have risen and the edges to be golden brown if you can see the edges. Finish baking and serve with your favorite cup of coffee! Enjoy! Previous Post Poppin’ for Popcorn! Next Post 2012…It’s me time!